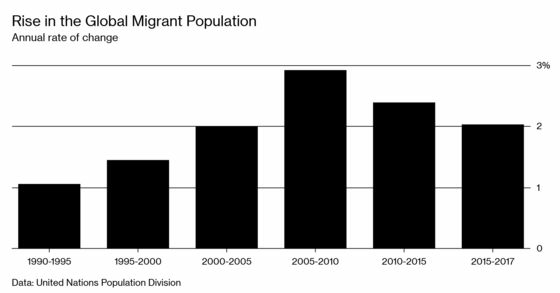 (Bloomberg Businessweek) -- Gallup recently estimated, on the basis of polling in 152 nations, that about 750 million people around the world want to move to another country. That’s a lot! North America and Western Europe are the most favored destinations, which will conjure visions for some people of vast waves of immigrants crashing upon their shores. Saying you want to emigrate and actually doing it are very different things, though. According to Gallup, 16 percent of U.S. residents wish to leave. The U.S. diaspora is something less than 3 percent of the domestic population, so I’m guessing a lot of Americans aren’t serious about their stated intentions. In other countries, the will might be there but the way is not. Immigration restrictions play a role, but so do low incomes, as many lack the resources to leave. As incomes rise in a poor country, emigration does, too. Eventually, though, increased affluence and falling birthrates bring a reversal. In a 2009 paper that documented this “emigration life cycle,” economists Timothy Hatton and Jeffrey Williamson found that emigration from Asia and Latin America was already slowing, and that while it was on the upswing in sub-Saharan Africa, overall emigration from developing countries was likely to decline in coming decades. United Nations data in fact show a modest global migration slowdown since 2010. Climate change and political turmoil might create new pressures on people to move, and much depends on the future trajectories of incomes and still-high birthrates in Africa. Still, far from facing a vast new global migration wave, we may be witnessing the beginning of the end of one. At a fertility rate of 2.1 births per woman, population stops growing. The global fertility rate was 2.4 and falling in 2016, according to the World Bank, but the decline isn’t uniform. In sub-Saharan Africa the fertility rate was 4.8, meaning there’s lots of population increase still to come there. Emigration tends to peak at a per capita gross domestic product of $8,000 to $10,000. Every world region except sub-Saharan Africa is now at or near that threshold. Civil war in Syria has unleashed a recent refugee surge, but before that, UN estimates of refugee numbers were falling. Refugees’ share of world population remains lower than in 1990. Of the Central American countries now sending lots of immigrants to the U.S., Guatemala has a purchasing-power adjusted per capita GDP of $8,150, El Salvador $8,006, and Honduras $4,986. Fox is a business columnist for Bloomberg Opinion.